Soldiers march during the parade of the 73rd Armed Forces Day in Nay Pyi Taw, Myanmar in March. MYANMAR HAS NOT done enough to fulfil its promise to end the use of child soldiers and underage recruitment may even be on the rise, a top UN official has said. The military and a number of rebel groups have for years drafted underage soldiers to battle in several civil conflicts festering in Myanmar’s remote borderlands. The army vowed to end its use child soldiers in 2012, the year after it brought decades of junta rule to an end, and has discharged hundreds of underage soldiers in the years since. However, experts say children remain at risk as new underage recruits continue to trickle into the ranks of both the military and insurgent groups. Despite her “frank and constructive” discussions with authorities, UN special representative for children and armed conflict Virginia Gamba said that the army was not providing timely evidence that it was discharging child soldiers. “When we ask for information, when we ask for verification of places, when we ask about the detention of children, it’s too slow,” she told reporters in Yangon at the end of an official trip earlier this week. The answers come very slowly. Sometimes months or even years pass. Gamba added the UN was “worried” that some rebel groups battling the army were increasing the number of underage recruits in their ranks. Human rights groups have been highly critical of the country’s lack of progress in demobilising child soldiers. “Myanmar remains on a watchlist because of the military’s absolute failure to protect children in areas of armed conflict,” David Baulk, from regional watchdog Fortify Rights, said. Many child recruits have been sent to remote areas near Myanmar’s border with China, where a recent upsurge in fighting between rebel groups and the military has displaced thousands of people. 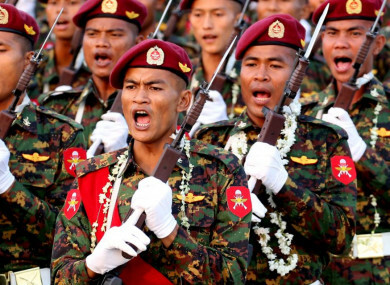 There are no concrete figures on how many children are still among the estimated 500,000 troops that serve in Myanmar’s military or insurgent armies. Email “Myanmar is 'failing to end recruitment of child soldiers'”. Feedback on “Myanmar is 'failing to end recruitment of child soldiers'”.